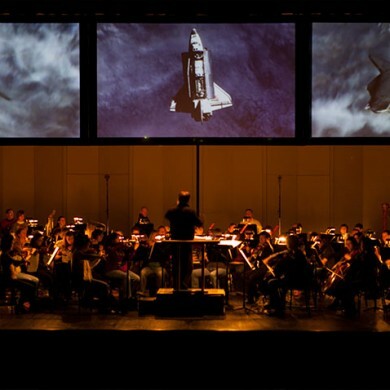 This symphonic spectacle carries the audience through space and time by combining live choreography of high-resolution astronomical images, dramatic pieces and informative narration, all accompanying the seven powerfully-cinematic movements of Holst’s popular suite. TND teamed up with the Springfield Symphony Orchestra, Wittenberg University and Stageworks theater group, to design, produce and perform this show. 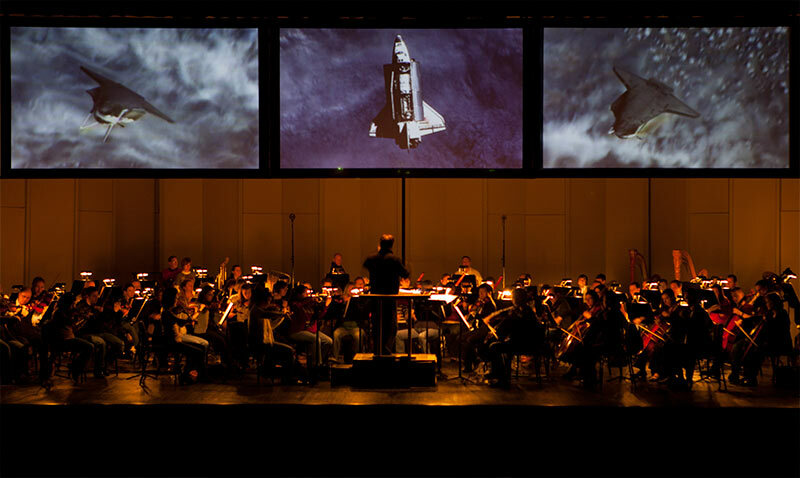 Unlike productions that simply display images of one planet during each movement, ‘Out of this World’ tells the cosmological story of the birth, life, and death of stars and the struggle of humankind to understand that story. Each of the musical movements focuses on a different aspect of that story and is accompanied by relevant imagery – mostly composed of actual photography, with a few exciting simulations thrown in. 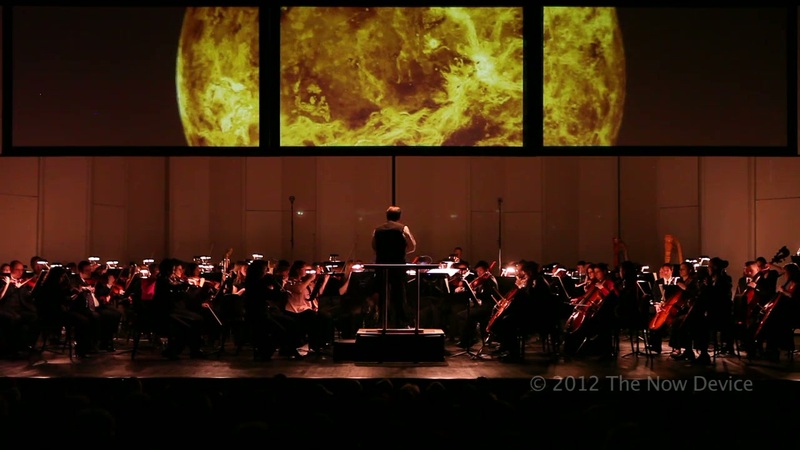 The Now Device is available to re-create this riveting, media-rich event with your orchestra. Please scroll down for more details. A series of observing sessions at a local observatory. 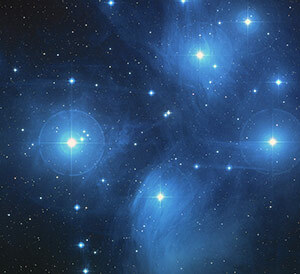 The life story of a star encompasses the evolution of planets, moons, and life on Earth. The audience experiences these stories through imagery and through narrative pieces which introduce each movement. That narration begins with an evocative description of early humans lifting their eyes toward the night sky and then guides the audience through the processes of star birth, planet and moon formation, the appearance of life on Earth, and the role of star death in seeding the Universe for the next generation of celestial objects. 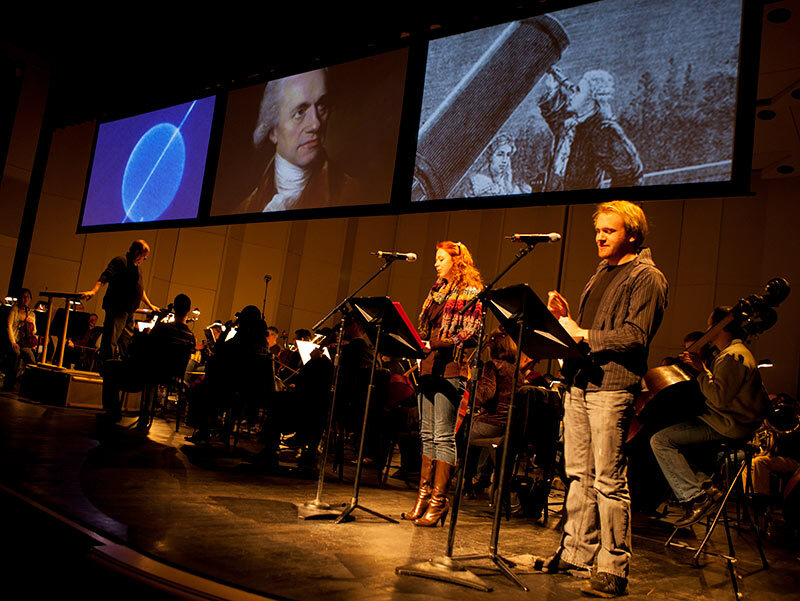 The narration also introduces the dramatic pieces and explains the relevance of the work of Cecilia Payne, Caroline and William Herschel, Galileo, and Albert Einstein to our attempt to understand the story of the stars. Four short dramatic pieces, meant to be read or acted by a small group of players, are interspersed with the movements. Our understanding of the life story of the stars is the result of centuries of curiosity and sustained intellectual effort. 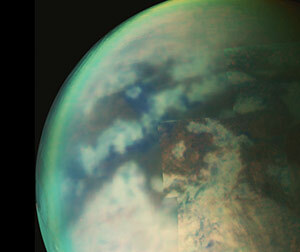 Like most human endeavors, that effort has been made despite enormous challenges. Each piece is based on the historical record and explores a specific set of challenges and the people who faced them. The technical aspects of the video for the show are all handled by The Now Device. We bring projectors, mixing equipment and screens. 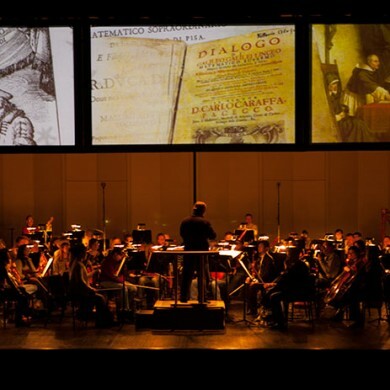 We provide stage design and carry out installation alongside the symphony’s technical staff, assuring that we are ready to participate in the normal rehearsal process. 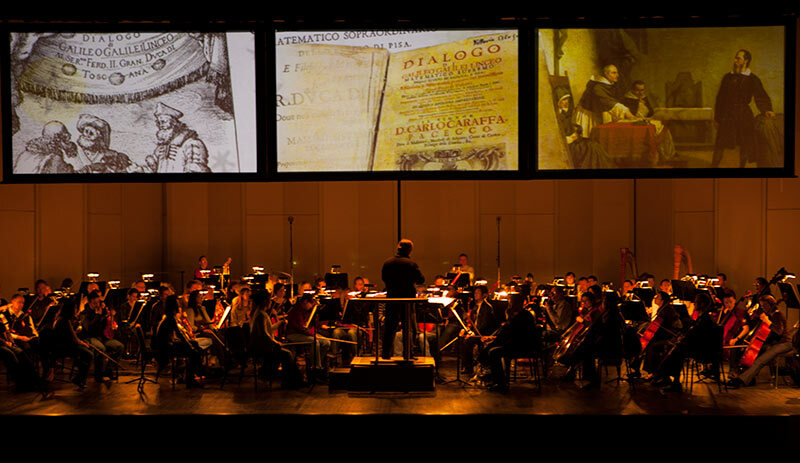 Symphonies provide the players, conductor, performance space and staff, music rental and local promotion. 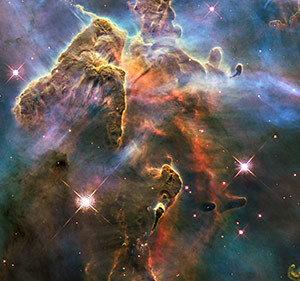 The high-resolution images and animations used in this production have been individually selected from over 50,000 recent and historical images from the NASA database of images from the Hubble Space Telescope, ground-based observatories, and interplanetary spacecraft. Each image was selected on the basis of its beauty, clarity, and relevance to the dynamical processes by which stars and planets are born, live, and die. What is the Live part of the show? Though the visual part of the show has been carefully crafted to fit with the music, live performances always vary. We have the technical means to keep the imagery, on multiple screens in-sync with the music. We do this by being present and controlling everything in real time. What other materials come with the Show? 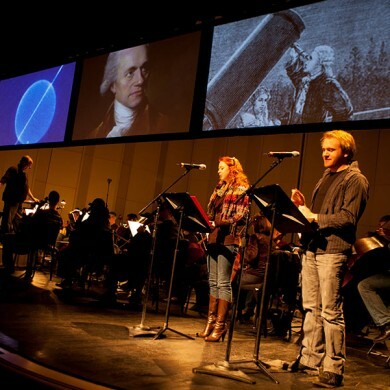 Scripts for the Narration and the Dramatic Pieces come with the show, though the option of using them, either as they are or in some modified form, is up to each orchestra. We also provide a twelve-page “Student’s Guide” which provides a wealth of background information to deepen the understanding of the imagery, narration, and dramatic readings for students of all ages. Part One of the Student’s Guide explains the nature of the objects depicted in the imagery and discussed in the narration, including the known universe, galaxies, the Milky Way, nebulas, stars, the Sun, planets, and moons. Part Two provides a short biography of each of the subjects of the dramatic readings, including Caroline and William Herschel, Cecilia Payne, Galileo, and Albert Einstein, as well as Gustav Holst. What options are there for the show? The show as we've produced it is formatted for a wide, HD experience, spanning 3 screens. It can also be mounted on a single screen, and the imagery can be fitted to a variety of physical formations to work best with each venue. This show can be performed with a live narrator, and live actors either reading or performing the dramatic pieces. It can also be performed with an off-stage narrator, with or without the dramatic pieces. The Planets is one of several innovative productions that have helped cultural institutions engage new audiences and forge closer bonds with local businesses. The Now Device also employs its visual media expertise to turn parties, openings, and other events into mesmerizing, one-of-a-kind spectacles.